JB Spatial is committed to reducing its impact on the environment. We care about the environment in which we live and work and the impact that our actions have on current and future generations. We will strive to improve our environmental performance over time and to initiate additional projects and activities that will further reduce our impacts on the environment. Our commitment to the environment extends to our clients, our staff and the community in which we operate. The company’s environmental management system applies to all operations and services of the organisation. Staff working in the company office or working remotely from a project or client office are expected to comply with the spirit of the environmental policy in the context of the organisation in which they work. The environmental management system is a set of interacting processes or elements. Each process or element of the environmental management system takes one or more inputs and creates one or more outputs to be passed onto one or more other processes or elements. 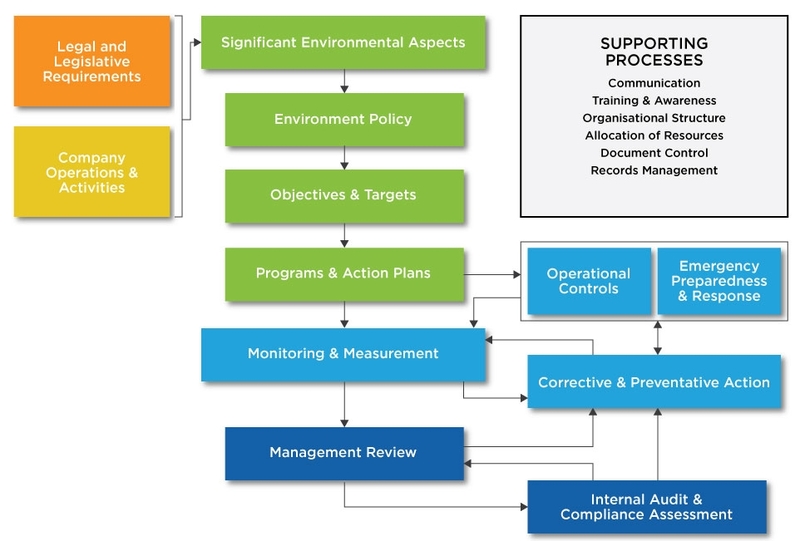 This is depicted in the above diagram, which can be viewed as a roadmap to the company’s environmental management system.